Outdoor camping in Bhutan is arguably one of the great ways to enhance your travel experience. Its close and romantic rendezvous with stunning landscapes, pristine and nascent environment, all permeating quaintness and more. On a conventional trek camping, small light weight tents are used with potentially curtailed amenities to serve as weight effective measures to make it easier for pack animals to carry. 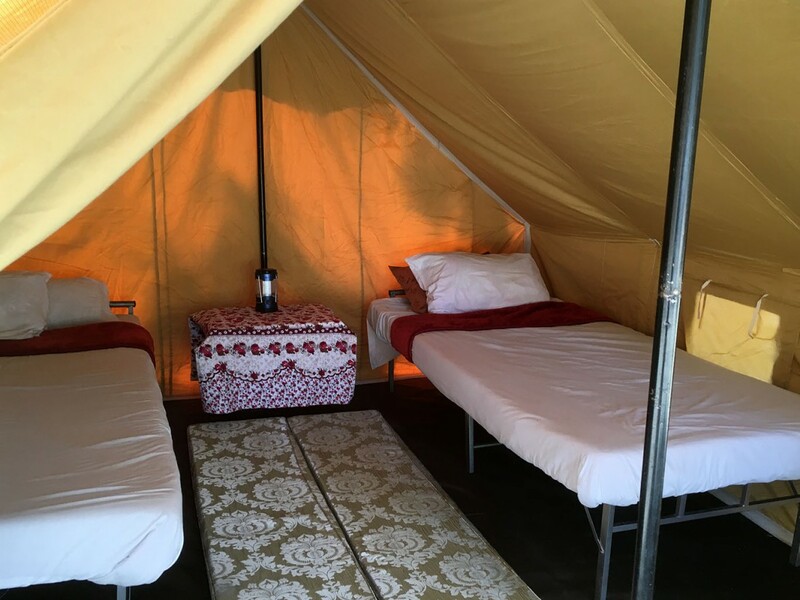 In contrast, Deluxe camping comes with lot of amenities and heavy duty gears to make your sleep as comfortable as possible in the wilderness, without worrying about the weight to haul them around, as they are transported in the vehicle. Deluxe camping allows you to be near a remote village, or an idyllic location for birding, fishing, to enjoy nature or mountain biking without worrying about having to travel great distance to get back to the hotel from these location. Your Room, and your private Cook and Waiter travels with you. Although it may not be as luxurious as hotel itself, Deluxe Camping expresses and brims with comfort, style and with amenities galore that aims at making it easier to experience the ideal outdoor adventure. 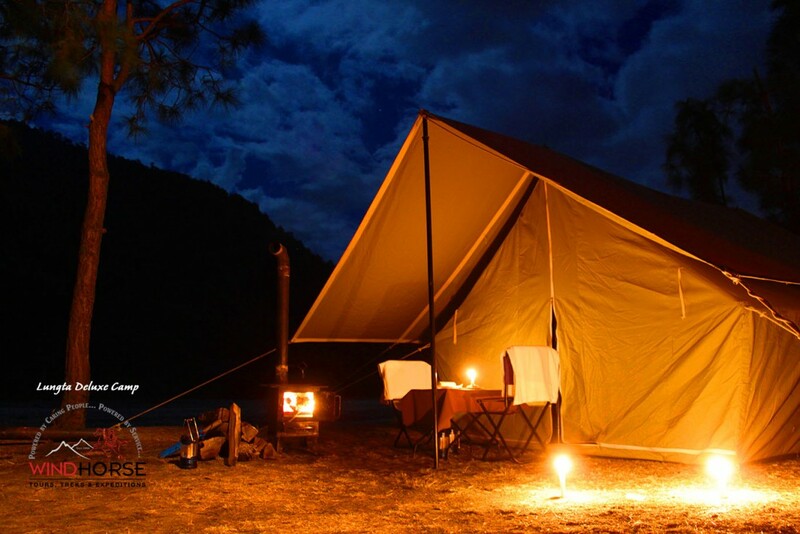 We truly believe that this camping experience without roughing up, will add great value to your outdoor experience. While you stay in pleasant hotels in the cities or towns, we can add few days of camping in between. There are multitude of places and region where Deluxe camping can thrive and these areas are generally amidst bountiful nature. What does Deluxe Camping means with Wind Horse Tours? 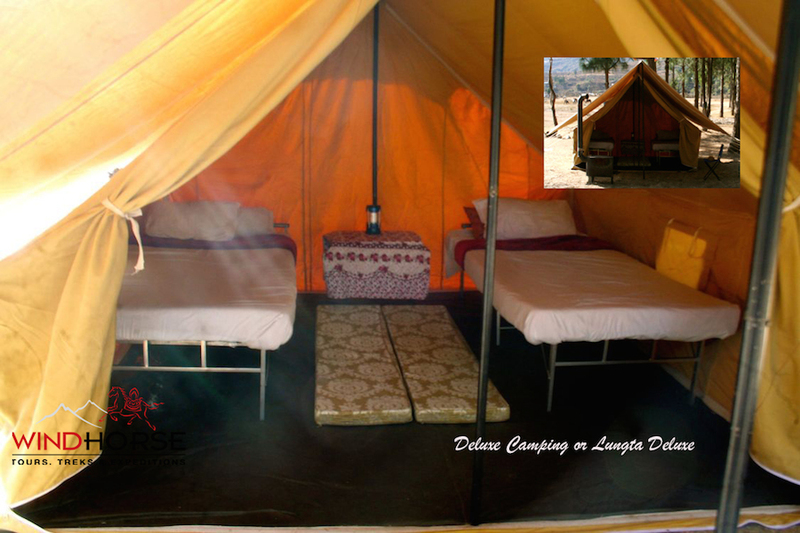 We provide two options in Deluxe camping. There are manifold structural aspects in place to make it a unique and extraordinary outdoor experience. Camp Tents – Large spacious tent (10′ x 10′ interior room) made from thick cotton canvas with poly and cotton fabric mix that retain warmth during winter and night and reflects heat during summer and day making it an ideal fabric. The extension in the front serves like a porch or veranda. The tent can fit two single folded beds (or join two beds to make one Queen bed) with study table and have enough space for your luggage. Soft mattress, bed sheet and pillow and pillow cover make it almost like home. The floors are sewn-in with water material. Dinning – Separate dinning tent with chairs and table is provided. Delicious meal featuring local ingredient, fresh vegetables and regional cuisines. Freshly prepared onsite. Dinning in relaxed and comfortable atmosphere. 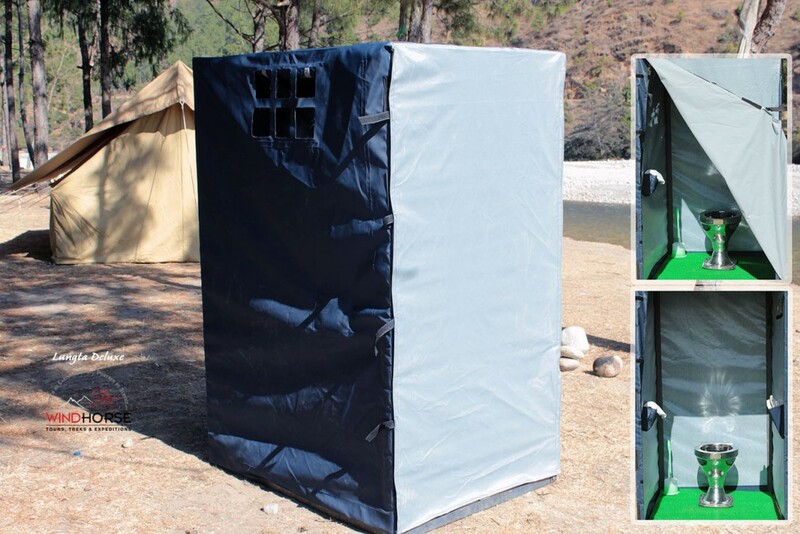 Restroom – Simple Toilet tent. A dug-out pit toilet with chairs. Evening – Tell tale and fun and frolic around cozy camp fire. Outdoor lounge area featuring best camp furniture, outdoor games and more. Human touch – Arguably, one aspects to take any trip to the elevated level. Allocation of good guide – seasoned, well versed and with an amicable nature. And also cheerful and friendly camp crew. Sharing the moment over the campfire or the games can only add a zing to your experience. A private Bukhari – a wood burning fire chamber with cylinder on the top that acts as chimney.